Sitting down to compose a hand-written note to a friend, an expression of gratitude to an acquaintance, condolences to a loved one, or for any other occasion is a wonderful gesture, and communicates your sentiments in a timeless, tangible way. 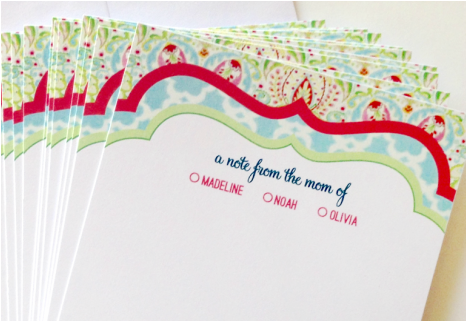 La Belle Fete offers a wide variety of personalized stationery for all of your correspondence needs. Whether you want something formal or informal, sophisticated or casual, we are committed to providing personal stationery that is an extension of the sentiment you wish to express.